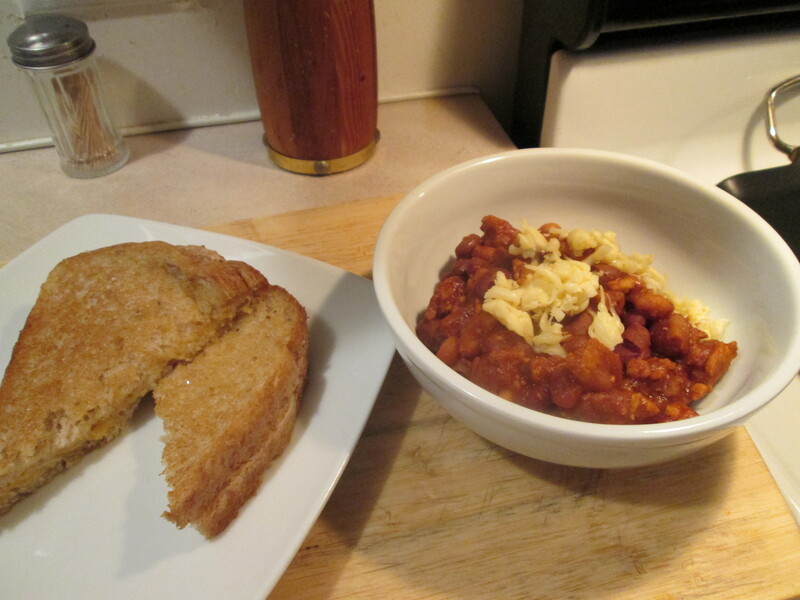 It was comfort food Heaven for dinner tonight, 3 Bean Turkey Chili w/ Grilled Cheese Sandwich! It’s good anytime of the year but especially when it’s cold outside, warms the body no matter how cold it is outside! So I took my last container of the Chili out of the freezer over night and let thaw in the fridge, then just warm it up and it’s ready to go. I make it with Honeysuckle White Extra Lean Ground Turkey and 3 different Beans; Spicy Chili Beans, Dark Red Low Sodium Kidney Beans, and Great Northern White Beans. 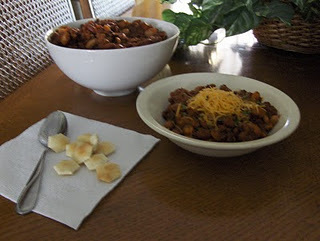 I add 1 Packet of McCormick Chili Mix to it and then load up the great spices on top of it; 1 Tbs Minced Garlic, 1 Tbs Ground Cocoa Chili Blend (McCormick), 1/2 Tsp Ground Chipotle Chili Pepper (McCormick), 1 Tsp. Ground Roasted Cumin, 1 Tbs of Cilantro Leaves, and 5 Dashes (or more) of Frank’s Hot Sauce or to taste! I also add 2 small cans of Tomato Paste and 1/2 cup of Water. COVER with lid and cook and simmer on HIGH 3 to 4 hours (or on LOW 5 to 6 hours). I cooked mine on low for about 5 1/2 hours. You’ll love the aroma as it slowly cooks. When ready I topped with just a bit of fresh grated Dutch Gouda and about 3 shakes of Frank’s Red Hot Sauce. I served it with a Grilled Cheese Sandwich that I made with Aunt Millie’s Light Whole Grain Bread and Sargento Ultra Thin Sharp Cheddar and Swiss Cheese. I used I Can’t Believe It’s Not Butter to butter the bread with before grilling. Grilled Cheese Sandwiches are great! You can fix it so many ways with endless toppings. Chili and Grilled Cheese, it doesn’t get much better! For dessert later a Honeybell Orange with some Apple slices.